Knitting Adventures on Land, Sea, and in the Air! Blackbooks on And Just What Might This Be? Adamlambertson on And Just What Might This Be? samchesdantes on And Just What Might This Be? ciptpemiFoott on And Just What Might This Be? anespissevy on And Just What Might This Be? gombtrumb on And Just What Might This Be? After being wow'd by our first lesson, we were in awe during the second lesson. We were treated to a morning with Kathleen Anderson, a knitter whose skills are described by her Shetland colleagues with terms like "brilliant," and "genius." Those terms and more apply to Kathleen's knitting. Not that we hadn't met Kathleen Anderson before. 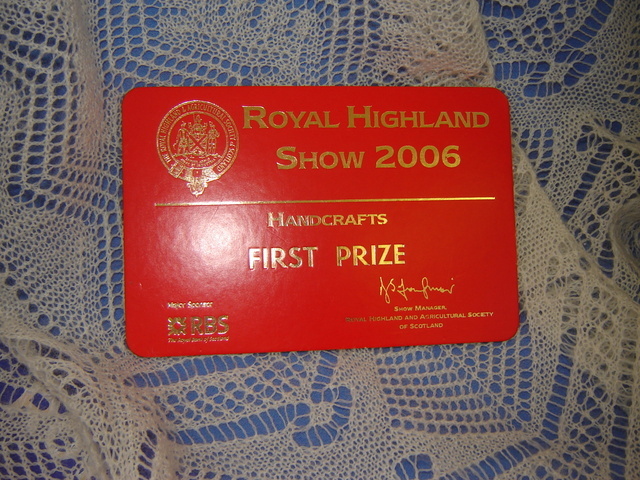 In 2004, she brought her knitting to a meeting of the Shetland Guild, where our tour group were guests, so we knew we were in for a rare treat. There was no disappointment. 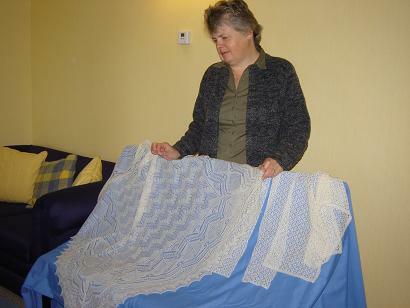 Here we see her with her lovely shawl on the left, and some other lace knitting beside it. 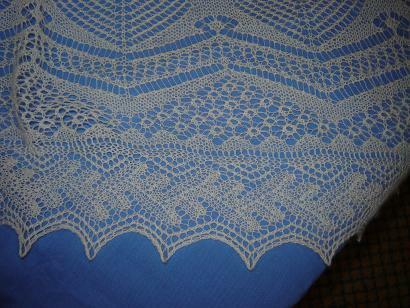 The prize winning shawl is made of a wool and silk blend that is feather-soft. Since we didn't need help casting up (the Shetland term for a yarn over,) or making decreases, we talked about her design process. She has certain favorite motifs, and loves to use the "elaborated Print 'O the Wave" motif. 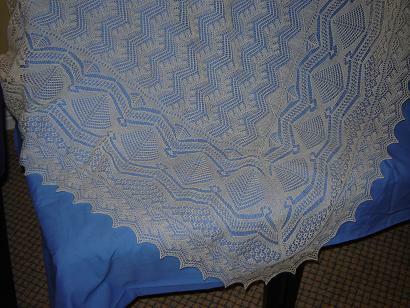 The border of this shawl is actually a design her sister did, years ago. You can see that it is a complex combination of motifs. So complex, in fact, that they could overpower the final effect, but they don't. We were all very aware that we were privileged to be seeing and touching a masterpiece. As you will have guessed by now, Kathleen did not have a pattern for this wonderful creation -- other than in her head, of course. Long familiarity with the motifs and their use, coupled with her expert skills, gave her the expertise to produce this final result. The Shetlanders are rightly proud that Kathleen Anderson has represented their craft so well. I never asked her how long it took her to knit the shawl -- I didn't want to know. 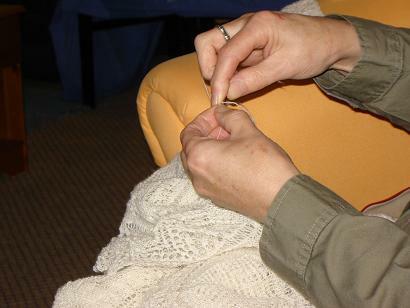 She is another lightening-fast knitter, so I know it would be too demoralizing to know. As always, our morning was gone too soon. I could have listened to her speak about the tradition of knitting on the islands and in her family much longer. We did more than simply oogle her shawl. She has begun to keep a workbook of the motifs that she uses so well, and generously allowed us to go through it. Kathleen's day job is post mistress of a small post office in her home, and she undoubtedly needed to get back to that. We bid her goodbye until the next Sunday, when we knew we'd meet her again at the Guild meeting. I've been privileged to experience some really fine knitters in my over fifty years of knitting, but I can't think of anyone of whom I'm more in awe than Kathleen Anderson, not least because of her generosity of spirit and the self-effacing manner in which she approaches her great abilities. After all, she says, "It's just knittin'." Sigh. Just beautiful! So inspiring. Oh, I would love to watch her knit...and her shawl is most wonderful. But I am currently fair isle-smitten, so am devouring your 'tails' on it. Hi Mary and thankyou for sharing your delightful trip to the Shetlands. I adore Kathleen Anderson's shawl as I do your knitting and love the way you expain how you achieved results which helps encourage others to try something just that bit more complex. Heirloom Knitting - Welcome to fine Shetland lace knitting, traditional knitting, free knitting patterns, projects, wool and more. Guernsey 5-Ply Wool and Knitting Accessories. Kittens, Puppies & Birds - Oh No!